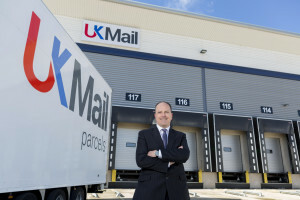 UK Mail’s new automated hub is now operating well with high service levels, the company said when it released its results for the year to 31st March. Peter Fuller, UK Mail group operations director. Problems with the operations at the new Ryton hub hit profits last year and resulted in CEO Guy Buswell stepping down in November. The company has been working to deal with these issues. It said: “A key decision we have taken is to introduce a second central hub which will specialise in handling the ‘non-machineable’ freight. This is a highly efficient cross-dock facility designed specifically for such use and, while it increases our overall central hub costs, it allows the automated hub to focus on ‘machineable’ freight while enabling us to retain significant volumes of ‘non-machineable’ freight which we see as a good profit stream. The group said revenue for the year was down 0.8 per cent on last year at £481.0 million. Operating profit before exceptional items was £11.2m, down from £21.0m the year before. Exceptional items included £16.5m in compensation for being displaced by HS2 but this was offset by hub relocation costs of £7.1m. Revenue in the parcels business, which represents 52 per cent of group revenues, rose 1.4 per cent. This was on the back of average daily volume growth of 4.5 per cent. Revenue was down 3.1 per cent in the Mail business, which accounts for the other 48 per cent of group revenues. However, volumes were up 5.2 per cent, against a background of an overall decline of 3 per cent in the mail market. Peter Fuller (pictured) has recently joined UK Mail as group operations director.